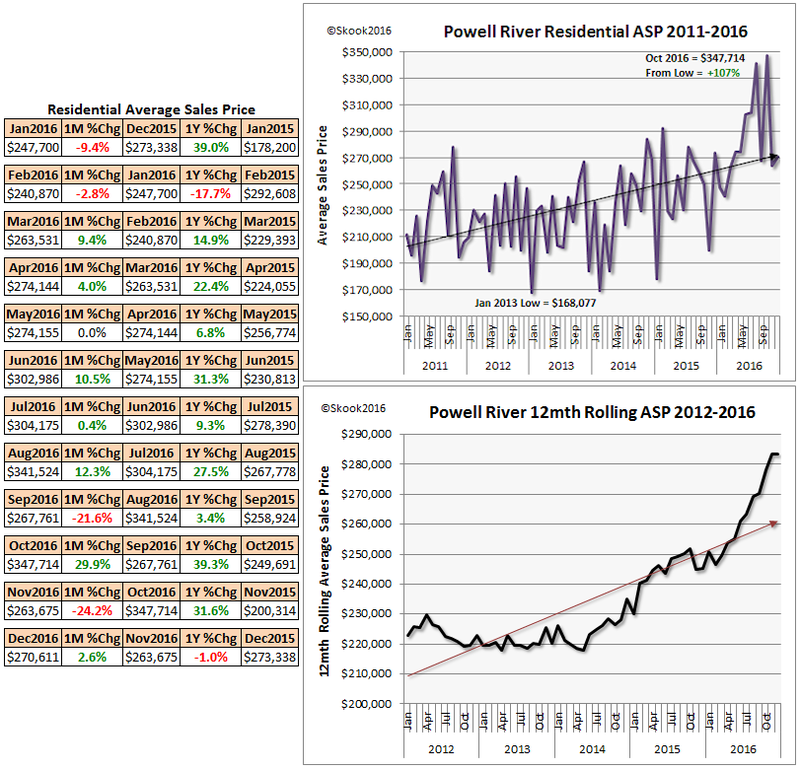 I have already posted Powell River year-end total residential unit sales and average sales prices charts for the years 2005-2016. Now I’ll take a more in depth look at the last six years and present month-to-month data tables for 2016. 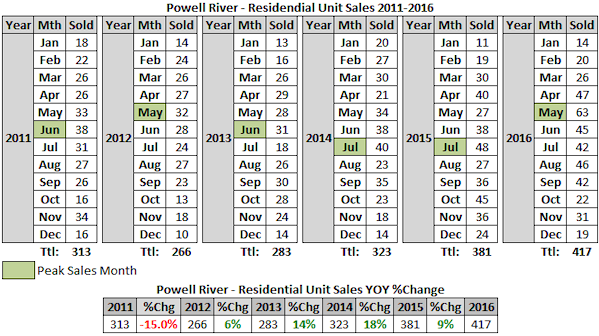 The tables directly below are straight forward; however, I’ll point out that peak sales in this latest real estate boom occurred in May 2016 - the same for the lower Sunshine Coast (Gibson to Earls Cove). The supply was definitely exhausted by then in both regions; but, maybe the pool of buyers was too. The charts show PR sales began to take off mid-2013 and that's almost a year and a half earlier than the lower SC. There is little doubt PR’s bargain-basement home prices played a big role. 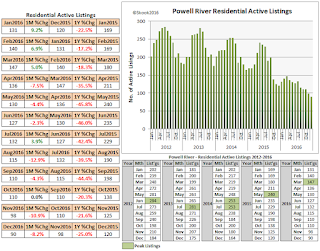 Unfortunately, I don’t personally know the Powell River market and can’t say if what we’re seeing is mostly speculative buying or a wave of new residents moving in. If Powell River is following the pattern elsewhere, I expect there has been a lot of speculation. Anyone familiar with the Powell River market, I’ld welcome your thoughts in the comment section. 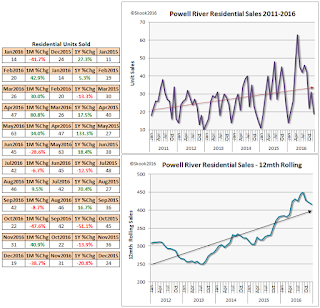 Powell River is small market and month to month sales and average sale prices will appear erratic when charted. You will see a trend form but it is hard to discern exactly when momentum starts to build or begins to diminish. As a result, I turned to a “12-mth rolling” sum in the case of unit sales and a “12-mth rolling average” for the average sales price to better show market trending. 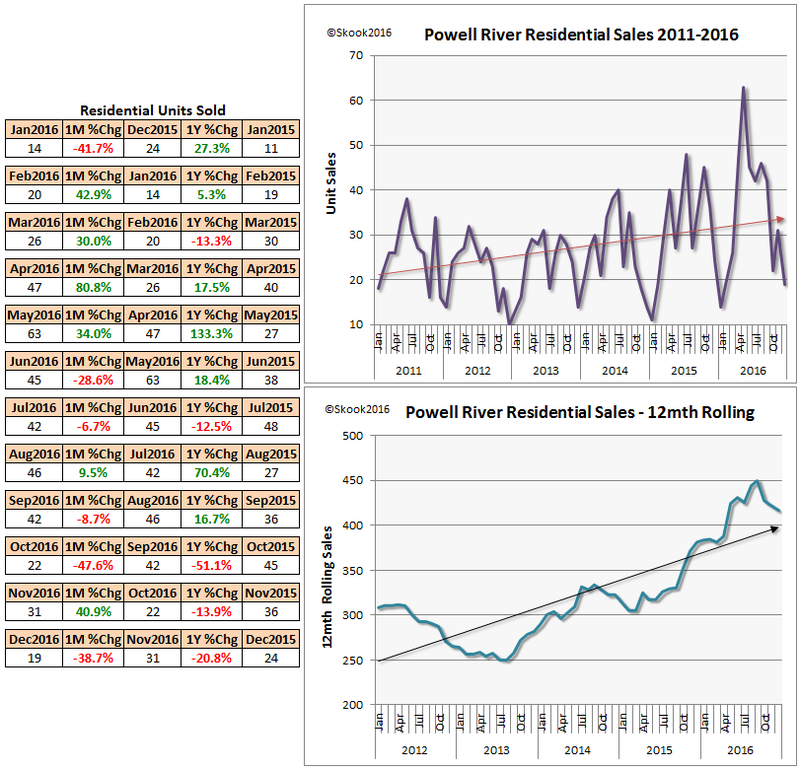 The 12-mth rolling sales chart directly below shows Powell River experienced two waves of residential buying beginning mid-2013 with sales accelerating in the latter half of 2015 and reaching a peak by mid-2016. It would be interesting to know how many homes bought in 2013-2014 were flipped in 2015-2016. On a month to month basis from 2011 to 2016, Average Sales Prices experienced their lowest point in Jan 2013 ($168,777) and their peak in Oct 2016 ($347,714). Using the “12-month rolling average” of the ASP, the trending shows a parabolic rise in residential prices starting late spring 2014 that steepens dramatically beginning Feb 2016. Rising parabolic curves in real estate sales are never a good sign as they’re interpreted as a bubble or as the industry pundits like to put it, “...a very frothy market.” The opposite, falling parabolic curves, is interpreted as a market crash. 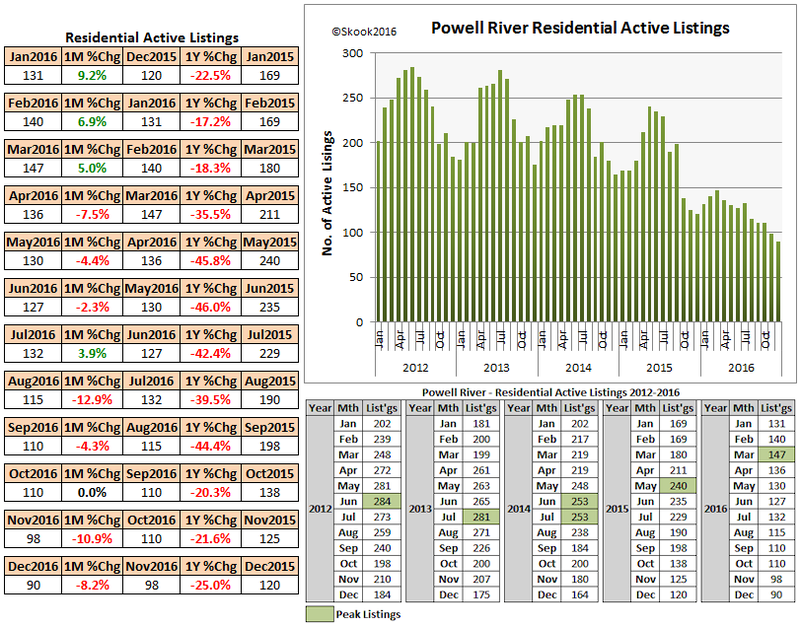 No one will be surprised by the Active Listings chart below given the sales results above. By 2016, there’s nothing left to buy - another reason for the near vertical rise in the 12-mth rolling ASP in the chart above. 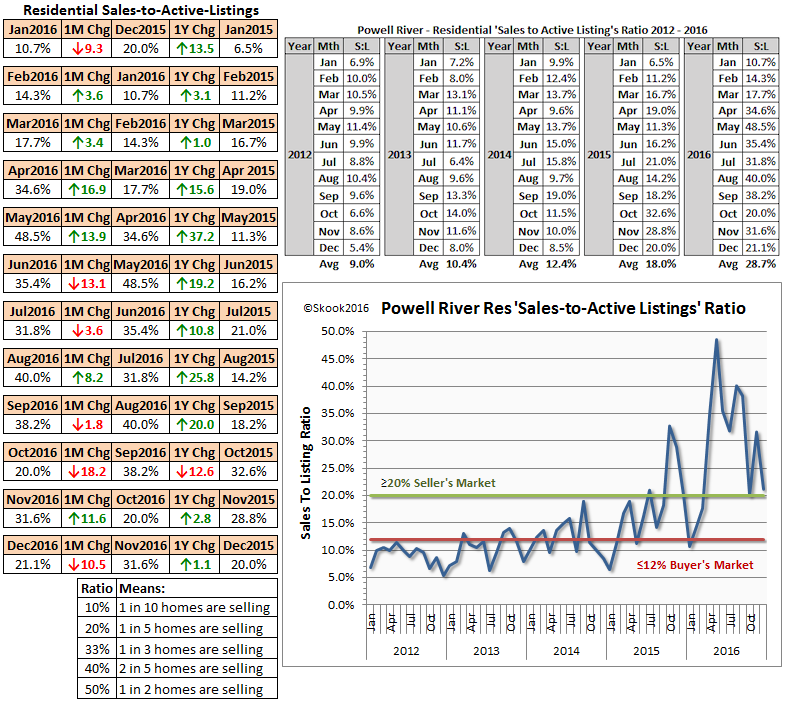 The Sales-to-Active Listings Ratio shows a Buyer’s Market in Powell River in 2012 and 2013; shifting to a Seller’s Market by mid-2015; and peaking in May 2016. 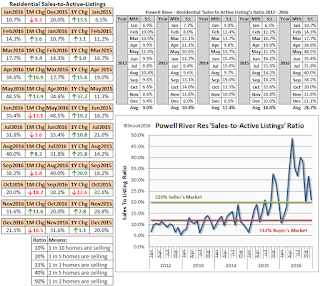 I have used REBGV percentage guidelines to determine a buyer's, balanced or seller's market. 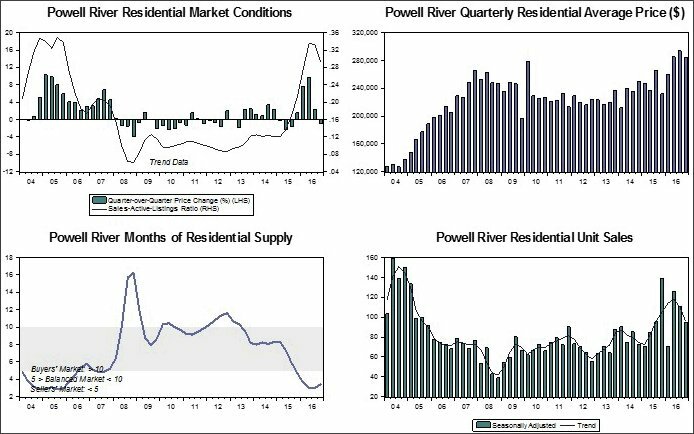 The following charts are the BCREA’s 2016 year-end tables for Powell River. I include them for your viewing enjoyment though they’re dull. 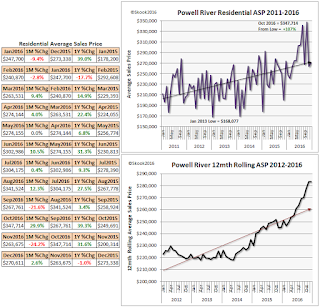 In my Powell River Intro post, I said the BCREA is stingy, boring and lazy with its data and charts. Next Powell River posting: population and demographics - we all know how exciting that is, but I'm doing my best to make it dazzling. Unfortunately, while the post may dazzle, the data should terrify all BCers.